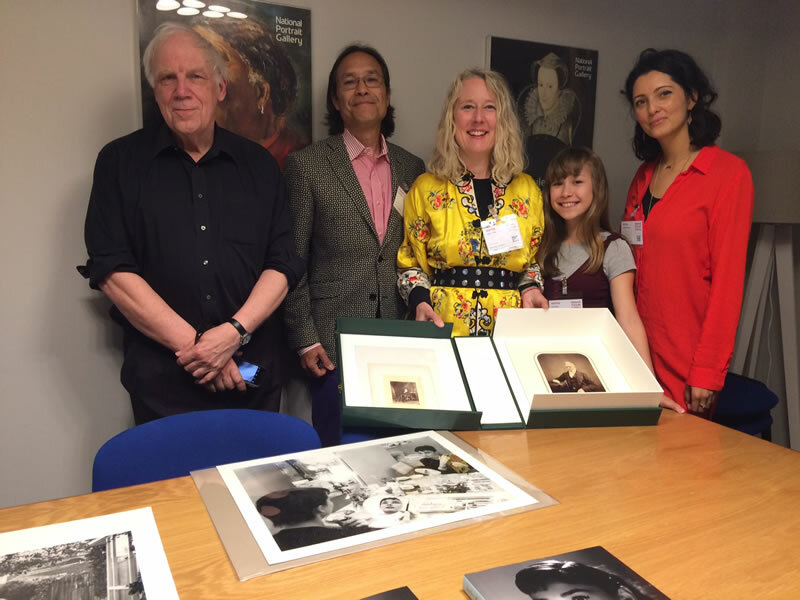 This photo, by Clare Freestone of the National Portrait Gallery, shows Terence Pepper, curator of the exhibition Audrey Hepburn, Portraits of an Icon with Mark Shaw’s son David Shaw with wife Juliet Cuming Shaw , daughter Luna Cuming Shaw, cousin and the Mark Shaw Photographic Archive’s UK representative Madeleine Cuming Khoshab. The National Portrait Gallery has added these two Audrey Hepburn prints by Mark Shaw to its permanent collection. (Also shown are the NPG’s portraits of Hugh Cuming, ancestor to Mark Shaw’s daughter in law Juliet Cuming).